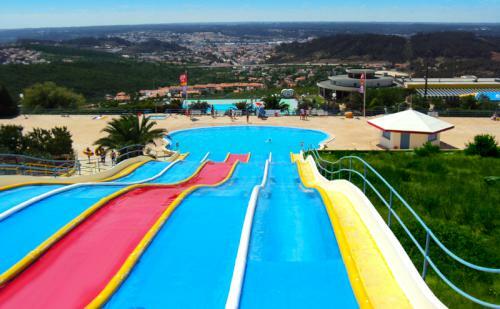 Panorâmico Aquaparque is an oasis of fun in the sun, located north of Lisbon in Pombal on the eastern coast of Portugal. The complex is open throughout the high season from 10.00 until 19.00 to offer some relief from the heat of the summer sun. 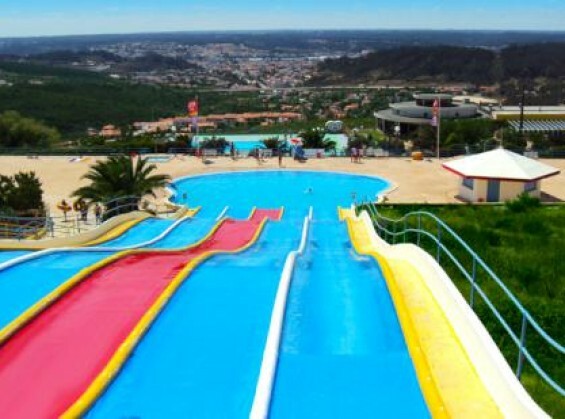 The park stretches over an expanse of rolling hills and its brightly coloured slides and chutes contrasting with the luscious greenery and deep blue sky of the Iberian Peninsula provide a real feast for the eye. 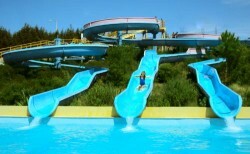 The Panorâmico Aquaparque occupies a total area of over 7000m2 with its centrepieces comprising a colourful 5-track chute and triple water slide. 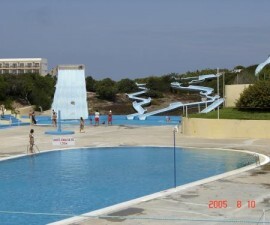 The chute provides a great place for friends and family to pit their wits against each other and see who can make the fastest descent or who can slide from top to bottom in the most creative position while the triple slide curls from top to bottom offering an enviable view over the horizon before depositing you in a refreshing warm water pool at the end of your ride. A rapid river weaves its way amongst the slides and chutes and through the greenery where guests can sunbathe on loungers or relax in the shade of the trees whilst watching their children enjoy the fun. 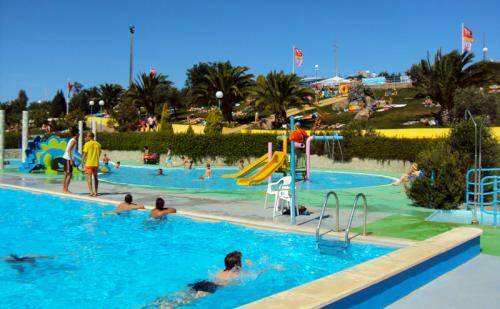 Younger guests are well taken care of at the park with a dedicated children´s swimming pool, a well-stocked sanded play area and the “Aqualandia” mini water park where children can play safely on colourful low-rise installations. There is plenty at the park to keep guests happy until closing time including plenty of eating options, games room and a gift shop. An additional range of conferencing and entertainment facilities at Panorâmico Aquaparque are available to guests all year round. These include a nightclub with capacity for 600 guests, panoramic restaurant specialising in rodízio (Brazilian barbecue) and a conference room for 350. 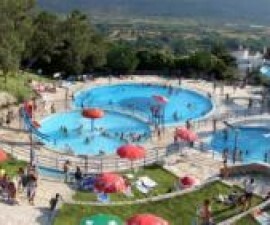 All-day and evening events can be booked using all or a combination of the facilities. 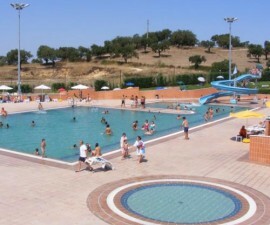 The park is easily accessible by road or public transport, located as it is close to the main A1 and A8 roads and connected by rail to Lisbon, Porto and a number of other well-known destinations. The dedicated car park has capacity for up to 680 cars. 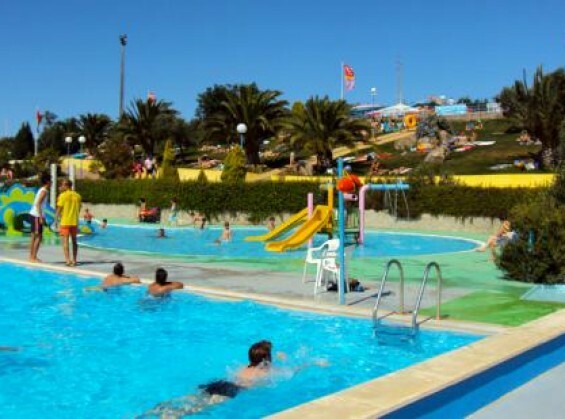 Visitors wishing to explore the local area will enjoy exploring Figueira da Foz, on the Atlantic coast a few kilometres away, or the old town of Coimbra nearby.